Lavache's Bicycle Race Refusal. Once the second hand on your personal life clock has begun to sag and fade after too many revolutions around the sun and you're old enough to have accrued some decent "mileage", the indicator pointed firmly in the range of "middle aged +++". Where do you turn if you want to race a bike. Here's two totally different approaches, let's begin with the lazy approach and follow up with the more recent development of sponsored Masters team racing. In 2010 Queensland veteran cyclist Lavache thought it would be great to invite a few of his old bicycle riding friends to saddle up one more time and go race in a teams time trial. His old buddies Seth and Rinaldo replied with all the wisdom gained from their many years of combined racing. 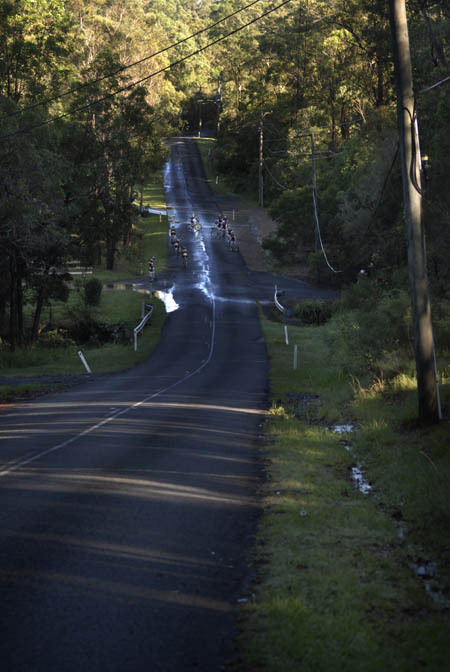 Are any of you interested in riding the Queensland Road Cycling Teams Time Trial, Sunday 19th Sept ? Lavache, I do not think you will succeed with this bunch as a TT requires both training and team work. Both seem to be in short supply these days. After 20 years of not racing in Queensland not much has changed I suppose, despite the growth in popularity of cycling, we still have the dark forces of the QCA and the anti cycling mentality of the Brisbane council that forces clubs to hold races beyond Timbuktu where its dry and hot and the roads are paved with unscreened gravel that contains fist sized lumps designed to stop bicycles in their tracks. Bloody Hell where is that coffee shop!! Lavache Team racing in Australia has come a long way since guys like John Whip got organised in the mid 80's and put together teams that ran on a shoe string budget. While Whip and his contemporaries were building a bridge from club racing to teams racing, blokes like Phil Bates had to contend with police pulling his Comonwealth Bank Classic race over to the side of the road whenever they thought it was getting out of control. Despite the popularity of cycling today and the presence of the NRS with sponsored teams, it's just as hard today as it was back then to put together bike races and teams to race in them. 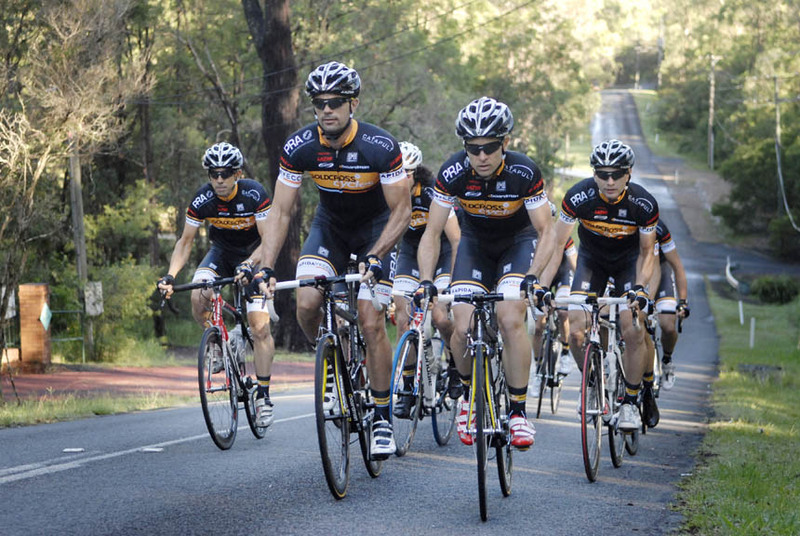 Now running alongside the NRS elite series there's a groundswell of masters still wanting to have a crack at racing. Not content to do it the old fashioned club focused way of the era when Masters were called Veterans, these new Masters riders are out hunting down sponsorship deals, putting together organised outfits then training and racing hard, yet the same set of obstacles are being encountered in this arena. Rapida Vecchi Bicycle Racing Team. In Queensland the Rapida Vecchi team are leading the way with a professional approach to Masters racing. Recently I caught up with Michael Davis team owner of Rapida Vecchi, here's his spin on Masters racing, organising a team, seeking sponsorship and how Rapida Vecchi fit into the scene. RAPIDA VECCHI Rapida: rapid, swift, fleet of foot. Vecchi: meaning "old one" or simply "old" in Italian. How did the concept for the Rapida Vecchi masters team evolve? A couple of years ago I made the decision to stop racing elite, real job, kids, can't do 700k's a week. It seemed like the logical time to migrate over to masters racing. The idea was to lessen the frustration of racing elite, I was quick enough to be competitive but couldn't manage the distances. I got together with a couple of mates, Waco Hamlin, Jim Robinson and Andrew Kelk. We decided to start out by having some fun and doing some track racing and have a good crack at a track season. We had an enormous amount of fun, no pressure, short racing in a short season. We did as much racing as we could in the local scene. We raced at places like Bundaberg at a big two day track event and we had a ball. It was really great, a bunch of guys, a van, fun stuff. We ended up doing the team pursuit together, we broke the state record at the state titles. Did you have sponsorship during that season? No it was just the four of us. We had the seed of an idea and we sorta sat on it for twelve months. 2011 was the first year of doing masters road racing. One of the things we realised is cycling has changed a lot in the last ten to fifteen years. We grew up in a different era. I did a lot of track racing back then, occasionally racing against the likes of Shane Kelly, Scott McGrory and somehow ending up in Kieren's with Stephen Pate. That was my upbringing, my formative years were in that era and especially in track cycling. It was a golden era of track cycling, especially compared to how it is now. Between Waco and myself there's a lot of experience there, so we decided to form a team around that based on - mates, racing and having fun - that's our ethos. Based on the experience and knowledge we have we feel like we can approach the building of the team in a very professional and successful way. We're not really about chasing medals, nationals, pan pacs, world championships. For a lot of us in the team we've already had that life experience when we were younger. We can now apply our combined experience to our weekly racing, the emphasis is on racing together and having a lot of fun - in the most professional manner we can. How did you approach expanding from a team of four into a sponsored masters racing outfit? We expanded the group from the original four who did the team pursuit together. Starting with choosing a team name, trying to be reflective of ourselves at this point in time, La Squadra Rapida di Vecchi (Rapida Vecchi for short) - swift and old. So we started looking around and talked to some of our old mates, all of the guys we know really well. Guys who during their cycling careers have had enormous success. We discussed the concept with them that we're not trying to become something that we're not, in order to achieve a "look", that at it’s core it’s about mates, racing, having fun, in a professional manner. You're not aspiring to compete in races which have a significant cost attached to participation, say on the other side of the globe. Just keeping it on a level where everyone has fun. We have a target of the kind of races and success we want, it's reflective of where we are in our lives, broadly speaking most of us have families, so we set realistic goals and expectations. We want to do the absolute best we can, at that level, and do it in the most professional way we can at that level. You have an affinity with cycle sport and a need to continue racing, yet adapting the situation to suit your circumstances with family and lifestyle. We're positioning ourselves in such a way that we can continue to enjoy racing. A quote from Michael O'Donoghue sums it up, one of our team riders, he's such a quiet achiever. We were talking to Michael about doing some track racing a couple of years ago and he wasn't sure that he could do it or not, he said "I might not be able to race for the next six months, but I have another forty years to ride my bike." Anyone who's in the team can pull their racing back and stay out of the game for a while if circumstance dictates, then come back in, it will still be there. This is related to how we race. This year was never about the individual, we're solely focused on a team result, the team is not focused on individual results, it's teams racing. Prize money for example, we pool the prize money, everyone is equal and the prize money goes back into the team. We use funds for training camps or perhaps a pizza night, it's based around the original concept of mates racing. We love nothing more than getting down and racing and being able to reflect on how well we performed as a team and how well we performed our roles to achieve a team result. The original idea was based around the old school experience, guys like Waco have international experience, our race tactics are borne of combined knowledge of a group of racers who've been in it since they were kids. Input from guys like Chris White who've had a vast amount of race experience, he's very valuable on the road. We've got guys on the team who really understand the concept of conserving energy over race distance, obviously that's a critical factor which can't be overlooked, especially as you're getting older. From the success that we had in 2012, we probably won about 80% or 90% of the races we entered. 2013 we won't necessarily have that success, others will learn from our endeavors. 2012 was all about achieving some on the road success, hopefully we've been able to exude some of our ethos, we're not bullies out on the road, we have respect from our peers. We had a drinks night late last year with some of the other Masters Teams, as recognition that we’re all masters and at the same stage of our lives, let’s enjoy it, enjoy competing, enjoy mateship after the race. How did your involvement with Goldcross come about? Due to some of the contacts we have, we formed a relationship with Goldcross Cycles. We're a bunch of guys racing at an age where a lot of people are just getting into the sport, so we’re hopefully an aspirational influence for those people. Goldcross are strong in the market of people looking to get into the sport , and it was agreed there were some perceived parallels, both in where we currently are and want to be, and ways that we could work together to mutual benefit. Now you're tapping into your racing experience as a team in order to provide feedback to Goldcross on their product development, especially with their range of Flight and Boardman bikes. Brand recognition and brand trust is strengthened via this feedback, ultimately benefiting the customer. You know the bikes have been tested by experienced riders in a racing environment. We test various products and there's a log of when we used the gear, there's a bit of effort there. Like the racing scene, times have changed and Goldcross are adapting to the market. A family can access bikes for the kids and still buy a race bike at the same time. Also access to your team exists as an interface between a racing team with a professional outlook, and a Goldcross customer looking to get into racing. A conduit to the racing scene and the goodwill that goes with it. We're helping Goldcross in their journey, giving them good feedback. The Goldcross management team are not guys stuck in the old model. The level of professionalism and success we aiming for with our racing team parallels that of Goldcross’ aims .. a level that their customers can also identify with. Hopefully people can come along to races and see us racing, being active participants in the scene, it's like a bridge. That will reflect well on Goldcross, people can say wow "that's a team of fast guys, all in the same demographic as me. Goldcross are backing a successful outfit." As part of expanding our participation, and giving something back, we'll compete in the Queensland Road Teams Series in 2013, we'll look at including some younger guys, we'll give them some experience racing at that level and we can chaperone them. It's not at the point where we're making a rod for our own back, it's at a level that's manageable. It's also helping to promote the sport, the more people that get involved the better. You won't need a massive budget for airfares and people on the ground then? Waco's a core part of the operation, he has a very busy career, so not as much time to train. So Waco's contribution to the team is that he is the mechanic or team assistant on the day, with feeding and numbers, anything. Hopefully towards the end of 2013 we'll have everything bedded in to the scale and professionalism that we wanted to target. Our budget has increased, if you have success then success breeds success. Goldcross are able to assist us significantly, we've also got more corporate partners on board, including PRA and Bodywise Osteo continuing from 2012, and Genesys, Galibier Partners, Bryan Byrt Renault, and Catapult Partners for 2013. We can provide value to those sponsors via our success. Sponsors will have the opportunity to see what we're about, we'll invite them to races so they can interface with the team. It's a team effort, for want of a better term, I'm the team owner and there are two or three other guys behind the scenes who do the heavy lifting. I make most of the strategic decisions, do sponsor engagement, and map out the annual agenda of events. Jim Robinson is the race team manager, he works on the logistics of accommodation and travel, getting race entries paid and numbers collected, all that behind the scenes stuff, working out who's going to do what racing. Then there's Waco who will help with race day logistics. For me, I can just worry about turning up at the race and helping the team achieve a result, just focus on being a bike racer for the day, that way I can focus more on high level strategic concepts. The riders themselves have great experience that they bring to the team from the real world, everyone has skills they can offer. In that case riders then take on a secondary role helping with team management, IT, logistics etc. Yes for example Waco can help welding up new parts for the trailer fitout. As another example Anthony Collins is an Osteopath, all of us go and visit him, he's always pushing us into doing more stretching and release work. Occasionally we’ll have a barbecue and beer night, we'll all bring along our yoga mats and release tools. Anthony will run us through a good routine that we can all implement. We're all having a blast, it's very busy, the job is enormous. I'm thankful to the guys in the team for what they bring to the table. Unlike Lavache and his lazy coffee drinking companions, Rapida Vecchi see the value in banding together to have a good time and still gain value out of doing something that's always been their passion - racing bikes.